The Stallion CWI-F25 bandsaw universal fence system was developed by CWI Woodworking Technologies for smoothness of operation and accuracy in the cut. 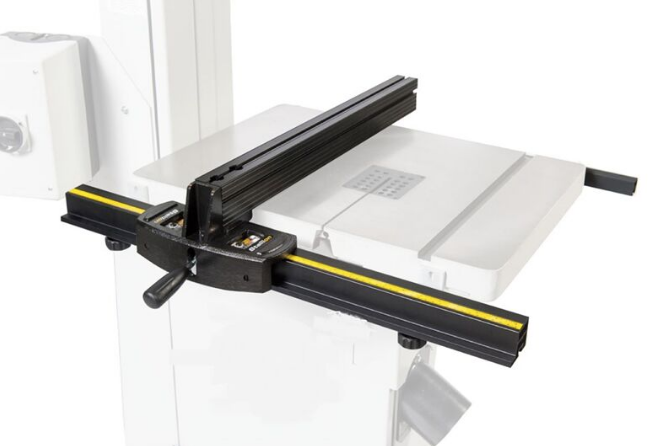 The F25 can be used on all bandsaws with tables up to 21” wide. The 25” long x 3” tall black anodized aluminum fence rides on a double ball bearing system for ease of movement on the 29” long front black anodized aluminum rail. There are magnified lenses on both sides of the fence to allow easy reading of the supplied self-adhesive measurement scale. The user can place the scale to read right or left up to 20” each way upon initial installation. The rails of the F25 easily slide right or left to allow for different cutting measurements or for blade changes by simply unlocking two lock knobs underneath each rail. The rails each have two mounting brackets which need to be bolted to the bandsaw table. If holes are not already provided the user will need to provide two ¼” holes on both the front and back sides of the table upon installation to mount the fence to their bandsaw. The fence has t-slot tracks on the top, back and face to allow mounting of extra tall fence boards, or other accessories the user may want to use.